Theresa May is embarking on a second cabinet reshuffle in a week after Priti Patel resigned over her unauthorised meetings with Israeli officials. The international development secretary - who was in charge of the UK's foreign aid budget - admitted her actions "lacked transparency". Mrs May is facing calls to replace her with another MP who voted for Brexit. Ex-Tory leader Iain Duncan Smith said the PM would want to keep a "balance" of views on the EU in her top team. He predicted she would not make "big changes" to the cabinet line-up and although Ms Patel's replacement would have to be "capable", their views on Britain's future relationship with the EU would also be a factor. "We are all Brexiteers now," the leading Leave campaigner told BBC Radio 4's Today programme. "So the question is to what degree do you want someone in that job to be in support of (Brexit Secretary) David Davis and others, and I think therefore the balance on having strong Brexit views is one that in all probability the prime minister will certainly look for." Ms Patel is the second cabinet minister to quit in the space of seven days, after Sir Michael Fallon resigned as defence secretary last week. He was replaced by one of Mrs May's closest allies, Gavin Williamson. According to The Times, European Union leaders are preparing for the possible "fall of Theresa May before the new year" and either "a change of leadership or elections leading to a Labour victory". Mr Duncan Smith said it was "a bit rich" for EU leaders to suggest Mrs May's position was precarious, at a time when the Netherlands and Germany faced difficulties forming governments, there was "chaos" in Italy and arrests of Catalonian separatists in Spain. 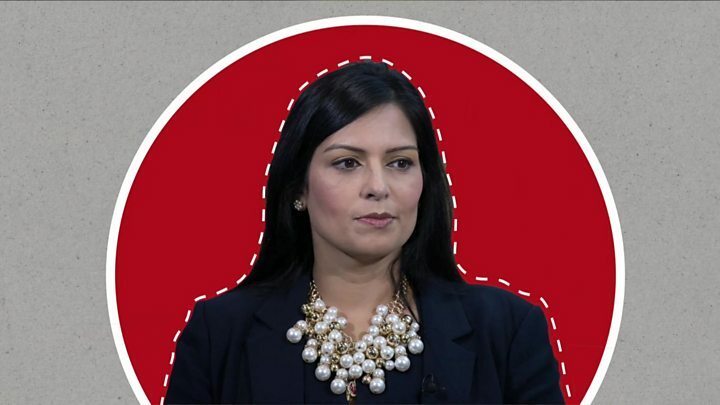 Priti Patel's difficulties began last week, when the BBC revealed Ms Patel arranged a number of private meetings with business and political figures during a family holiday to Israel in August. It later emerged that after Ms Patel's visit to Israel, she asked her officials to look into whether Britain could support humanitarian operations conducted by the Israeli army in the occupied Golan Heights area. But Foreign Office officials strongly advised against this as the need for humanitarian aid was greater elsewhere and giving aid to the military broke aid rules, BBC diplomatic correspondent James Landale said. Ms Patel, who has served as the Tory MP for Witham in Essex since 2010, was formally reprimanded in Downing Street on Monday and had to correct her initial media statements about the August meetings. But on Wednesday two further meetings arranged without government officials present came to light, one with Israeli public security minister Gilad Erdan in Westminster early in September and one with Israeli foreign ministry official Yuval Rotem in New York. Asked if Ms Patel had been foolish or had made a concerted attempt at freelance foreign policy, the BBC's James Landale told the Today programme: "I think it's pretty clear that the view within the government is there was an attempt to try to shape British policy within the Middle East." Ms Patel was accused of breaching the ministerial code - which sets out the standards of conduct expected of government ministers. In her resignation letter, she said: "While my actions were meant with the best of intentions, my actions also fell below the standards of transparency and openness that I have promoted and advocated." In her reply, Mrs May said: ''As you know the UK and Israel are close allies, and it is right that we should work closely together. But that must be done formally, and through official channels. ''That is why, when we met on Monday I was glad to accept your apology and welcomed your clarification about your trip to Israel over the summer. Conservative MP Jacob Rees-Mogg suggested disgruntled Remainers could be behind the leak that led to the downfall of Ms Patel. He told BBC's Newsnight that some people were "still very bitter" about the referendum result and "inevitably that colours their behaviour". Meanwhile, Labour deputy leader Tom Watson has suggested there were more questions to answer: "I have been informed that while she was in Israel, Ms Patel met officials from the British consulate general Jerusalem, but that the fact of this meeting has not been made public. "If this were the case, then it would surely be impossible to sustain the claim that the Foreign and Commonwealth Office was not aware of Ms Patel's presence in Israel."